Ratings roundup is a rundown of rating news from the past week and is derived from press releases and reports around the industry. In this week’s edition, Telemundo is off to a hot start in their 2018 FIFA World Cup debut, Fox Sports kicks off their coverage of the World Cup as well as the conclusion of the 2018 U.S. Open on their network, NBC Sports relishes in the victories of Justify and the Washington Capitals, the 6 p.m. edition of SportsCenter has continual growth, ABC wraps up broadcasts of the 2018 NBA Finals, and ESPN Deportes makes network history. Mexico’s thrilling 1-0 win over defending champion Germany brought big numbers for Telemundo. 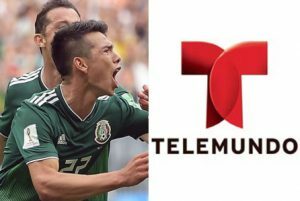 The Mexican national team had a very good Sunday with their shocker 1-0 victory over defending champion Germany in the 2018 World Cup, but Telemundo also a truly most excellent day. Snagging a surging 6.56 million viewers for the 8 AM PT-starting Group F match, the NBCUniversal-owned network saw its best Sunday daytime audience ever with the game, which marked the most watched group stage match ever on Spanish-language TV. With the game erupting from a goal from Hirving Lozano at the 35-minute mark, the overall sets of eyeballs are also the most for any Mexico World Cup group stage match in any language on any network since the stats began being collected in 1994. Telemundo’s viewership of the Father’s Day match topped the same game in English on Fox Sports 1 by 46%. Then, there are the realities of contemporary TV consumption with streaming and other platforms. All of which, once you factor in TelemundoDeportes.com plus the Telemundo En Vivo and NBC Sports apps, pushes viewership for Mexico’s first World Cup win over Germany to 7.4 million. The game was the most live-streamed event Telemundo has ever had with 1.1 million unique online viewers. In the 9:30-9:45 AM PT slot, the game peaked at 8 million viewers. When you add the Telemundo and Fox average numbers, nearly 11 million people in the U.S. watched Sunday’s game. 6.56 is just below the 6.8 million that Univision Deportes had for the Mexico-Brazil game that saw the premiere of both teams in the 2014 World Cup. However, the game four years ago was also simulcast on Univision and the numbers are a blend unlike the straight Telemundo results. Also for Telemundo, Sunday’s game is the new most watched sporting event in the net’s long history. Historic results and nail-biting conclusions led FS1 to record numbers on Sunday with a pair of FIFA World Cup Group Stage matches accounting for the channel’s two most-watched men’s soccer matches ever. Mexico’s 1-0 win over defending World Cup champion Germany drew 4,002,000 viewers, only to be eclipsed later in the day by Brazil’s exciting 1-1 draw with Switzerland, which attracted viewership of 4,086,000. Through the first four days of the tournament, World Cup matches on Fox and FS1 are averaging 2,241,000 viewers, which is up +32% over the complete Group Stage average of the last four World Cups combined, excluding U.S. matches. Led by international superstar Neymar, Brazil and Switzerland played to a 1-1 tie on Sunday in a match that began at 2:00 PM ET and delivered a combined viewership of 4,301,000 on FS1 and Fox Sports streaming sources. The television-only audience makes the match the most-watched English-language soccer telecast in the U.S. since the Euro 2016 final and is up +119% over the 2010 World Cup Group Stage average, excluding U.S. matches, and up +58% over the 2014 Group Stage average, excluding U.S. matches. In a match that kicked off at 11:00 AM ET, Mexico captured its first ever World Cup win over Germany in thrilling fashion, delivering a combined audience of 4,254,000 on FS1 and Fox Sports streaming sources. The television-only audience is up +114% over the 2010 and up +54% over the 2014 World Cup Group Stage averages, excluding U.S. matches. With an average minute audience of 252,000 and 717,000 live streamers, the match ranks among the top 10 best-performing events all time on Fox Sports streaming services. Through Sunday, World Cup matches on Fox and FS1 are attracting large audiences across the country. Washington D.C. leads the metered markets with an average 3.39 rating through Match Day 4, followed by Providence (2.77), Austin (2.66), New York (2.5) and Miami (2.47). With a lineup featuring the World Cup, U.S. Open Championship, Major League Baseball and NASCAR, Fox Sports streaming platforms enjoyed their biggest weekend since Super Bowl LI with 332 million minutes viewed from Friday through Sunday. Over the first four days of the 2018 FIFA World Cup, viewers have consumed 288 million minutes on Fox Sports streaming services. Led by Fox Sports social accounts, which delivered 18.1 million video views on Sunday, Match Day 4 was Fox Sports’ best performing day of the tournament across digital platforms with 19 million total views, a +30%increase over the previous day. Fox and FS1 generated the most social conversations over the weekend, led by the Germany vs. Mexico telecast on FS1, which was the most talked-about telecast of the weekend with 1.4 million social interactions. @FoxSoccer set another daily record on Sunday with 5.4 million views on Twitter, including World Cup Now hosted by Rachel Bonnetta, beating its previous record, set on Match Day 3 by +21%. Saturday morning’s Argentina vs. Iceland match delivered an average of 2,973,000 viewers on the Fox broadcast network. The dramatic FIFA World Cup Group Stage battle between neighbors Spain and Portugal, powered by superstar Cristiano Ronaldo’s hat trick, delivered more than 3.2 million viewers across Fox Sports platforms on Friday. The linear telecast on the Fox broadcast network delivered 2,924,000 viewers, peaking at 3,660,000 viewers from 3:30 to 3:45 PM ET. The average viewership number was up 13% from the 2014 Group Stage average, excluding U.S. matches, and up 57% from the 2010 average with the same exclusion. Portugal-Spain is the most-streamed match of the tournament to date, and a top-10 all-time performer across Fox Sports streaming platforms. The match scored an average-minute audience of 287,000, with 819,000 live unique streamers. Including VOD, the match reached 819,000 total unique viewers. Uruguay-Egypt delivered 903,000 viewers across Fox TV and streaming sources with an early morning Eastern time zone start, followed by Iran-Morocco, which scored 1,695,000 average viewers. Social platforms drove nearly 20 million total video views and an additional 20 million Snap Publisher Story views across Days 1 and 2. 4.2 million unique visitors accessed Fox Sports digital platforms (inclusive of FoxSports.com, Fox Sports Go, Fox Sports Mobile and Fox Now) on the second day of the FIFA World Cup, up 77% compared to opening day. Highlighted by a historic victory for Brooks Koepka, the first golfer to win back-to-back U.S. Opens since Fox Sports golf analyst Curtis Strange accomplished the feat nearly thirty years ago, 32.517 million viewers tuned in for all or part of Fox Sports’ presentation of the 2018 U.S. Open Championship. Overall, the 2018 U.S. Open accounted for 6.339 billion minutes consumed on the Fox broadcast network and FS1. More than 15 million viewers were watching NBC’s Belmont Stakes broadcast on Saturday as NBC Sports’ Larry Collmus called the race. Collmus’ thrilling call of the 150thBelmont Stakes on NBC, watched by 15.3 million television viewers in the 6:45-7 p.m. ET quarter hour, was also heard throughout Belmont Park and cheered by the 90,000+ in attendance, as Justify became only the second horse in history to remain unbeaten in running to a Triple Crown (Seattle Slew, 1977). Justify is the 13thTriple Crown winner, and only the second to win the all three American Classics – Kentucky Derby, Preakness Stakes and Belmont Stakes – in the last 40 years (American Pharoah, 2015). The full race portion of the telecast (6:22-7:13 p.m. ET) posted a Total Audience Delivery (TAD) of 12.7 million viewers on NBC, NBCSports.com and the NBC Sports app, which was the weekend’s most-watched event. NBC Sports Digital’s presentation of the Belmont Stakes ranks as the most-streamed Belmont Stakes requiring authentication, delivering 6.2 million minutes and 233,000 uniques. The Average Minute Audience (AMA) for the Belmont Stakes via the NBC Sports app and NBCSports.com was 79,200 viewers. NBC Sports Digital’s replay of the Belmont Stakes with Collmus’ race call, plus additional Belmont video coverage (including “Collmus cam,” and Patriots tight end Rob Gronkowski cheering on his namesake horse) was viewed more than 7 million times across NBCSports.com, the NBC Sports App, YouTube, and Facebook. Collmus’ race call alone accounted for more than 5 million video views. The 2018 Belmont Stakes (6:22-7:13 p.m. ET) posted a 7.5/19 fast national rating on NBC, with an average of 12.6 million TV-only viewers. Thursday night’s series-clinching Game 5 of the Stanley Cup Final averaged a Total Audience Delivery (TAD) of 6.714 million viewers on NBC, NBCSports.com, and the NBC Sports app — making it the most-watched Stanley Cup Final Game 5 in 16 years and up 51% vs. last year, according to Fast National Data by the Nielsen Company and Adobe Analytics. Alex Ovechkin and the Washington Capitals won the first Stanley Cup in team history last night with a 4-3 victory over the expansion Vegas Golden Knights at T-Mobile Arena in Las Vegas, Nev. The five-game Stanley Cup Final averaged a TAD of 4.918 million viewers — making it the most-watched Final in three years and the most-watched Final without an Original Six team on record. TV-only viewership peaked at 9.087 million viewers from 11-11:15 p.m. ET. The game produced a TV-only 3.88 household rating on NBC. Streaming of Game 5 set an NBC Sports Digital record for an NHL game with 381,000 uniques, up 119% vs 2017’s Game 5. The Average Minute Audience (AMA) of 124,000 viewers is best ever for an NHL game on NBC, the third-best overall (NBCSN games are Top 2), and up 100% vs. last year’s Game 5. Thursday night’s game delivered 24.5 million live minutes, up 121% vs. 2017. Overall, The five-game Stanley Cup Final between the Capitals and Golden Knights was the most-watched Final since 2015’s Chicago-Tampa Bay six-game Final (5.600 million); up 3% vs. last year’s six-game Final featuring Nashville and Pittsburgh (4.762 million); and the best on record (since 1994) for a Stanley Cup Final without an Original Six team (Boston Bruins, Chicago Blackhawks, Detroit Red Wings, Montreal Canadiens, New York Rangers, and Toronto Maple Leafs). The Final averaged a TV-only household rating of 2.73. Overall, The 2018 Stanley Cup Playoffs averaged a TAD of 1.45 million viewers for 83 games across NBC, NBCSN, CNBC, USA Network, Golf Channel, NBCSports.com, and the NBC Sports app, tying it with 2014 and 2015 for the second-most watched Stanley Cup Playoffs since 1997, behind only 2013 (1.47 million), which featured a six-game Final between Original Six teams Boston and Chicago. The 2018 playoffs were up 4% vs. 2017 (1.39 million). The Playoffs averaged a TV-only 0.83 household rating. With Sage Steele and Kevin Negandhi taking over as consistent anchors on May 14, the program averaged 531,000 viewers through the rest of the month, up 19% over the 447,000 average for the same period in 2017. The 6 p.m. SportsCenter has been keying on delivering fans up-to-the-minute news, previews, and analysis of the night’s slate of games and events. For the quarter of April, May, and June to date, the program has averaged 491,000 viewers, a 6% rise over the average of 463,000 for the same period last year. So far this month, the program is up 2% over 2017, while for the entire month of May, average viewership was up 6%. April’s programs saw a 9% year-over-year rise, which followed a 4% rise for March. Golden State’s decisive victory over LeBron James and his Cleveland Cavaliers averaged 17.6 million viewers and a 10.0 household rating, down 14% and 12%, respectively, compared to last season’s five-game set. Year-over-year comparisons were particularly knotty; in delivering an average audience of 20.4 million viewers per broadcast, the 2017 Finals was the most-watched NBA title tilt in 19 years. If the Warriors’ ruthlessly efficient dismantling of the Cavs robbed ABC of a potential ratings bonanza — Game 7 of the exhilarating 2016 series averaged a staggering 30.8 million viewers and a 15.7 household rating, making it the most-watched, highest-rated NBA game of the post-Michael Jordan era — the mismatch still managed to outshine the century’s two preceding sweeps. Warriors-Cavs IV out-delivered the 2007 San Antonio-Miami wipeout by 89%, and edged the Lakers’ 2002 sweep of the Nets by 11%. Compared to ABC’s historical average, the fourth Warriors-Cavs set out-delivered the network’s first 15 years of NBA Finals coverage by 11%. The 2003-2017 championship series averaged 15.9 million viewers. This year’s household ratings were up 5% compared to ABC’s all-time average (9.6). The Spanish-language telecast of the NBA Finals — the fourth-consecutive matchup between the Golden State Warriors and the Cleveland Cavaliers — concluded as the most-watched finals in the network’s history since they started airing the NBA Finals in 2013. Overall, the 2018 NBA Finals was up 12% and garnered 162,000 impressions. Game 2 of the NBA Finals on June 3, 2018 — a win for the Golden State Warriors — was the most viewed NBA Finals game with 205,000 impressions. In addition, the 2018 NBA Playoffs on ESPN Deportes were the most viewed NBA Playoffs since 2015, up 7% from last year. The 2018 NBA Conference Finals were up 38%, garnering 82,400 impressions.